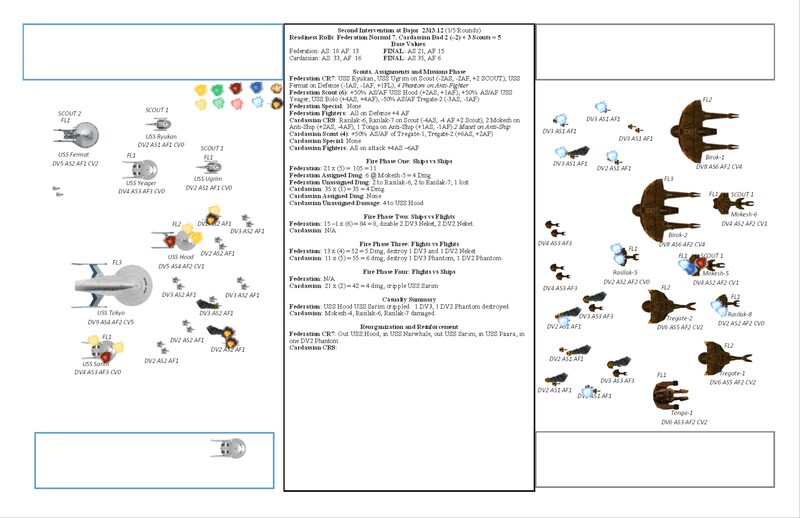 OK, so I finally have enough time to really go into full test mode for the galaxies rules (all my big professional hurdles and such done for a while). The year is 2310. With technologies like Warp 7+ drives, dilithium recrystallizers, and more becoming common, a new era of galactic expansion and conflict is beginning. We will guide the Federation through it. 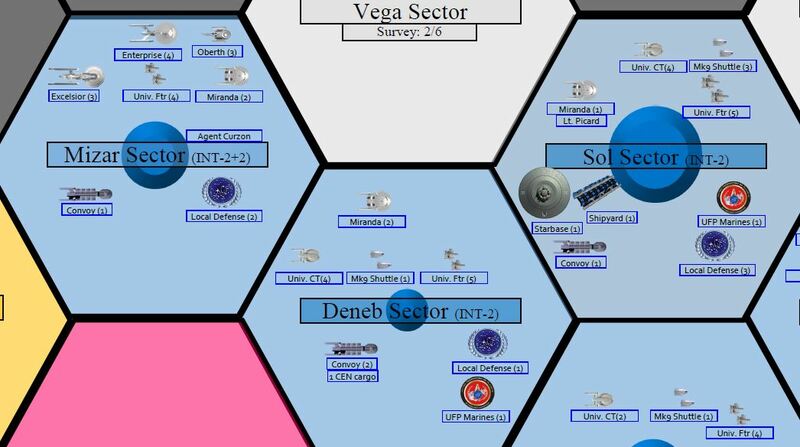 We have the VP secured by initial expansion of our colonial infrastructure, and are pursuing the VP available for two full system surveys (obtained in a manner similar to exploration.) Exploration is unique to each Empire, as is Surveying, so we can compete for new systems in more ways than before. 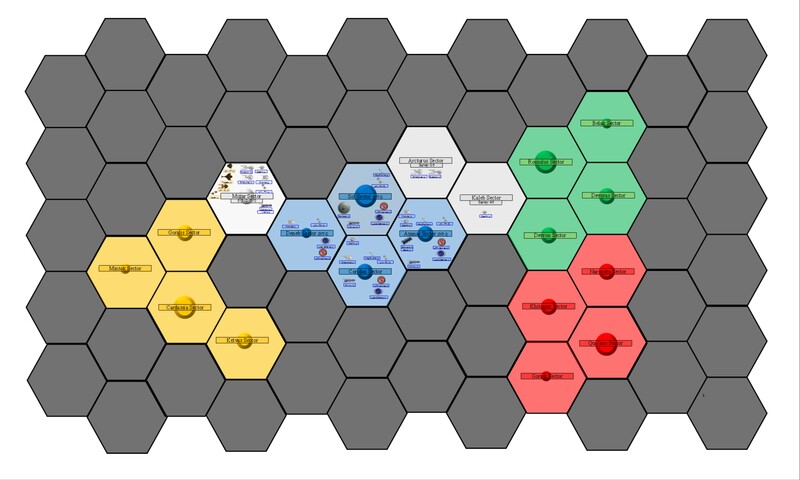 I am running the other Empires in a semi-abstracted way until they go to war with one another. 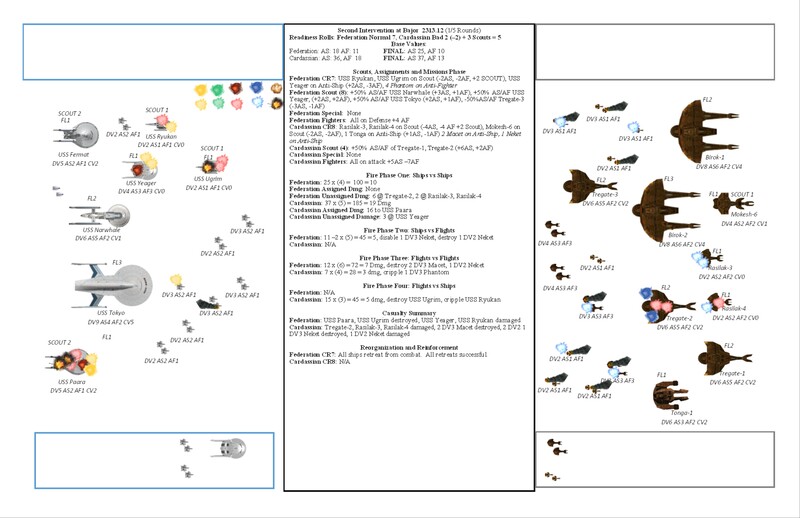 The specific location of every ship is in a kind of Schrodinger's Cat state, but I keep track of their exploration efforts and economies. Can I keep the Federation on the peaceful path it followed historically? Or will the tense situation in Mizar devolve into a first contact war with the Cardassians? More to come soon! Comments appreciated! The year 2311 has managed to avoid the outbreak of any open conflict so far, though the Klingon-Romulan border is ominously silent. and in 2311.08, a coded transmission from agents operating a subspace monitoring station finally (after several tries and a waste of a lot of resources) gave us a glimpse of the body of the Cardassian fleet operating only on the border of the new federation colonies in the Mizar sector. It's worrisome - those Birok class ships are larger than anything the Federation currently operates, and Starfleet command is not confident of the chances of the 3rd fleet stationed in Mizar if the current standoff with the Cardassians becomes aggressive. 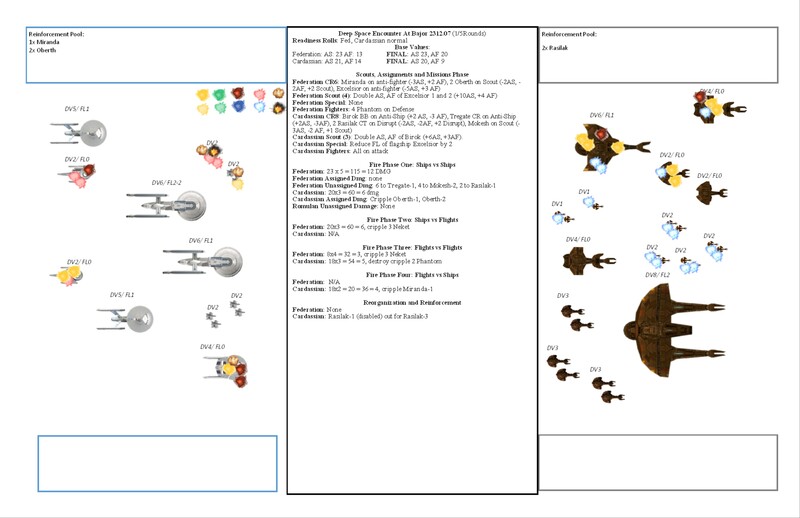 Between the not-officially-acknowledged Romulan neutral zone attack in 2311.02 and this battle, Starfleet is considering new ways to change doctrine to better protect the vulnerable Oberth-class ships during battle. In addition, a new directive from Starfleet Command responding to intelligence reports about the Cardassian Brintok-class took the form of a directive to construct at least four capital ships, which will strain our existing shipyards. The one real upside in 2311 was meeting the Bajorans, a minor power with whom we quickly signed a non-agression and then a trade treaty. Perhaps they can become a new member of the Federation someday! With the first set of VPs at our disposal, we have to decide how to trade them in. 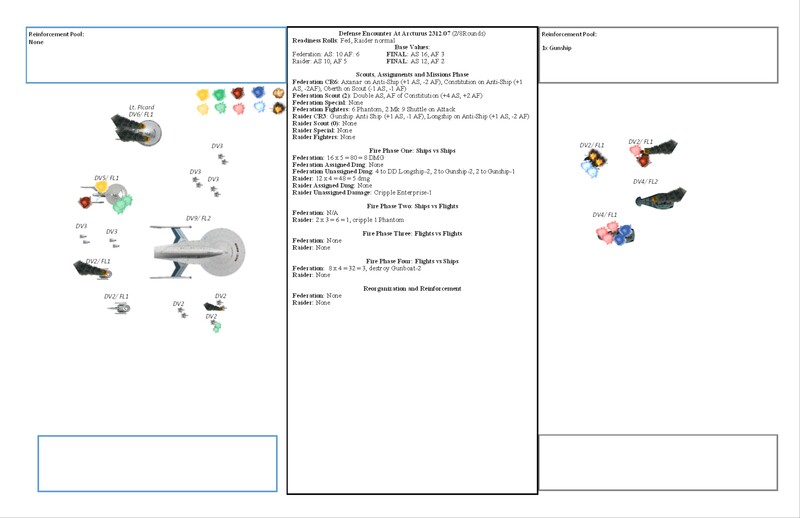 I drew up some experimental rules for what to do with VP that I'll be using here: Optional and Clarified Rules Document. We'll recruit our first two officers for the campaign with 10 of the points (10x2=20 XP), and save the last couple of them. 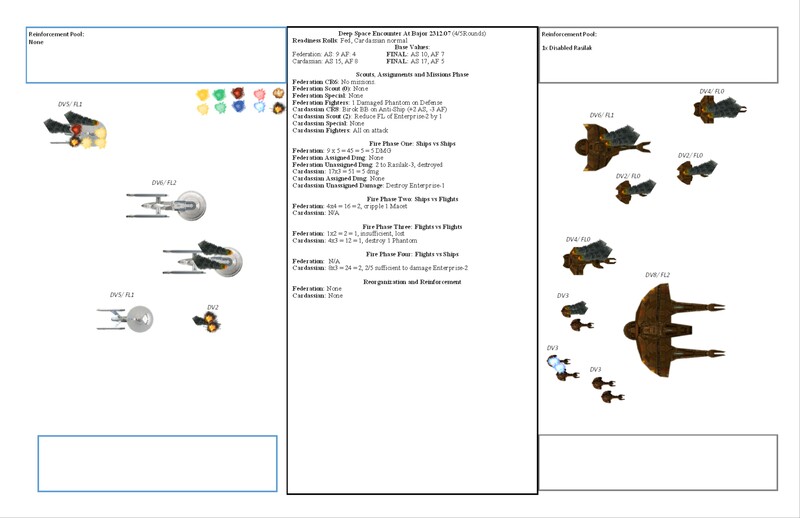 Our two officers will be Lt. Picard (+1 DV to assigned ship) and Agent Curzon (+2 to Intel of assigned system). Now we look forward to the year 2312 - it's going to be a tricky year, especially to meet the goal of building those heavy ships without breaking the bank or our construction capacity. I'll be playing it out a bit this weekend, but also would love commentary or suggestions! Edit: minor problem. Mizar should only have an intel of 1, since it has a PROD of 1. 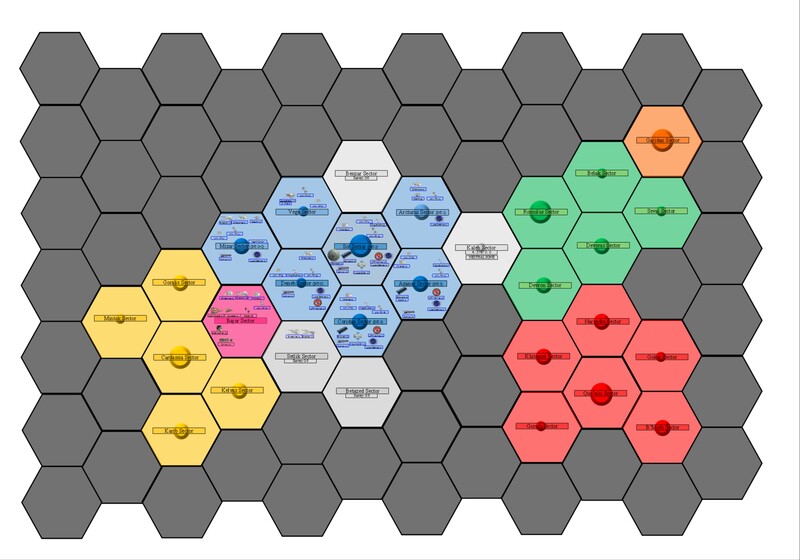 Corrected on my gameboard, will correct in the next screencap. 2312 was an exhausting year! Repeated diplomatic overtures with the Bajorans were mixed - though they readily agreed to trade and allowed Starfleet to patrol the sector's systems, they refused to consider applying for Federation membership - and the Federation was wary of their highly religious, caste-based society as well. (In game terms, I proposed numerous status changes and backed them up with paid-for Diplomatic intel missions). In the meantime, Starfleet Command demanded - and got - a commitment to build several larger capital ships in case of conflict with the Cardassians (in game terms, I rolled a new objective again, this time to build 4+ capital ships of CB or larger). 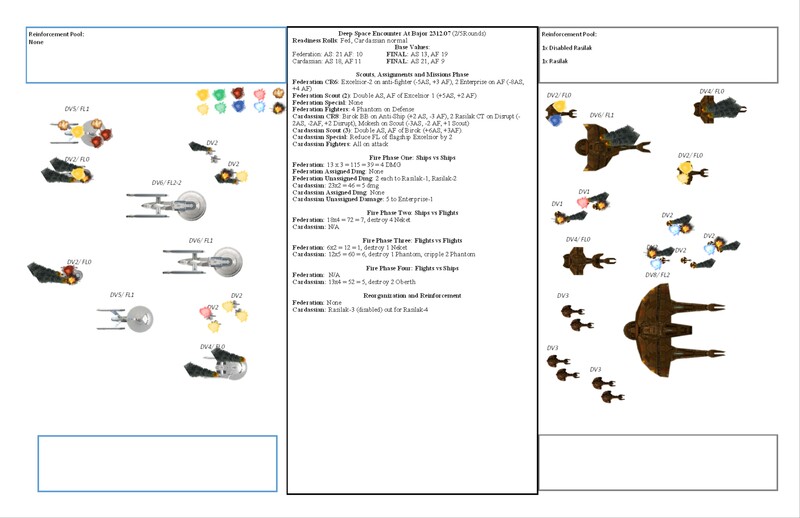 All year, construction was ongoing on two Axanar-class carriers, ships drawn up in the late 2290s in case of an all-out war with the Klingons and now brought back up from the archives. 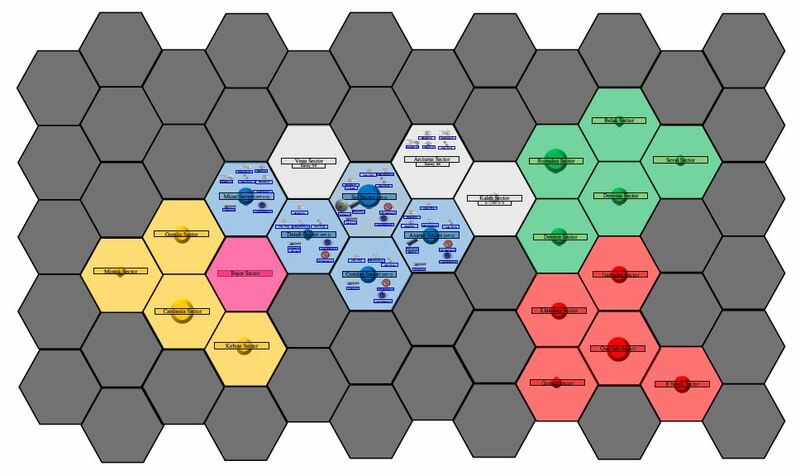 Colonization, negotiation with minor new member worlds, and exploration continued apace, primarily in the galactic north. However, there are whispers of other powers active in the area. 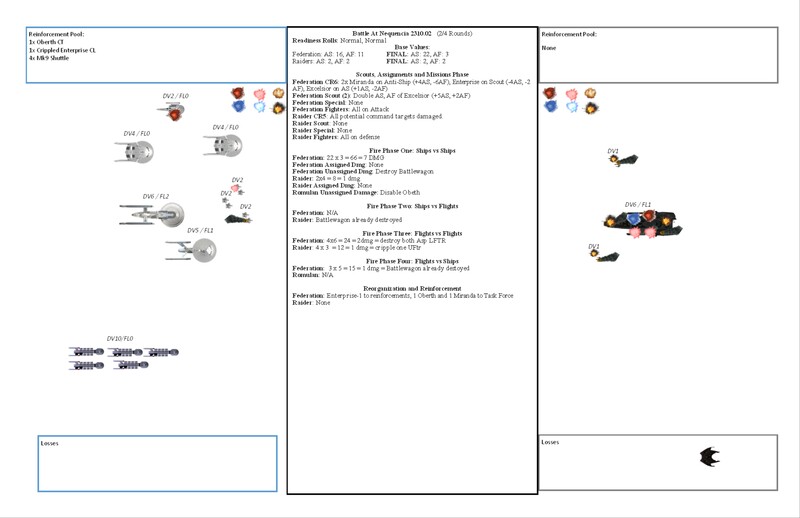 These rumors were borne out by the encounter between the two new science-survey cruisers USS Constellation and USS Stargazer while surveying the Vega sector with an unfamiliar vessel. The ship, at least heavy cruiser sized, opened fire on the Constellation, which was destroyed before the Stargazer could come to its aid. The only thing that prevented the whole mission from being a loss was the presence of mind of the executive officer on the Stargazer, Lt. Picard, who used creative maneuvers to avoid damage and destroy the enemy vessel. Predictably, the 3rd fleet's patrols in the Bajor sector eventually encountered a large Cardassian task force. Despite best efforts to de-escalate the situation, the Cardassians began attacking Bajoran civilian vessels and Admiral Ren'tala decided it was time to come to the rescue. The Bajor Intervention was an almost-unqualified disaster. 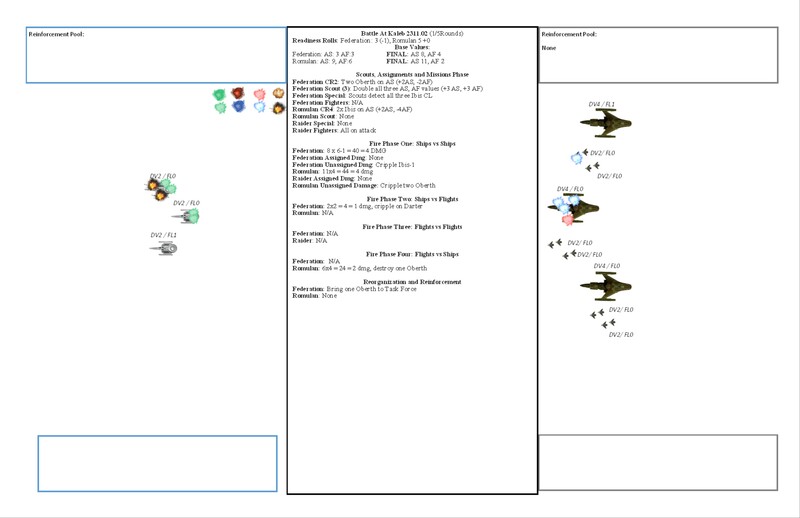 Total losses were substantial - the Oberth class ships Terrier and Noba were lost with all hands, while the Miranda class USS Chesterfield was able to evacuate most of its personnel before its destruction. Most important, though, were the loss of two expensive starships, the top-of-the-line Excelsior USS Rio de Janiero, and the Enterprise-class cruiser USS Teriss and half of its all-Vulcan crew. 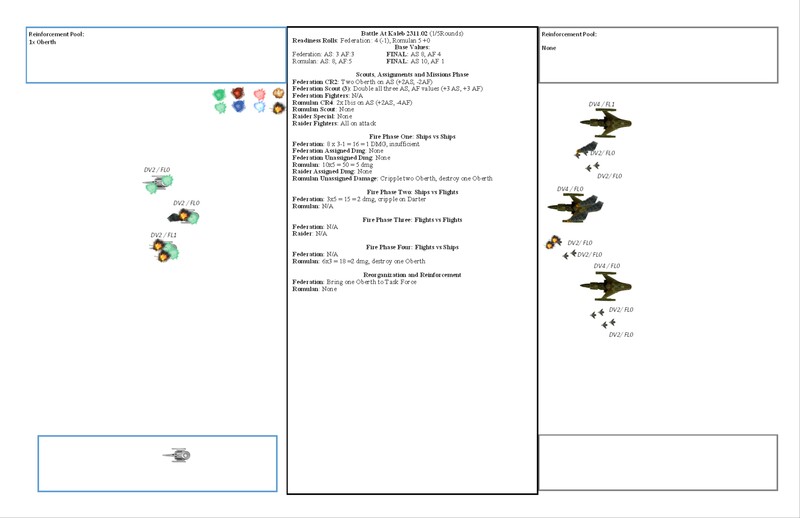 The small craft accompanying the fleet - older Phantom class warp-5 fighters - were also lost in large numbers. Though the Cardassian fleet suffered numerous disabled ships and a few lost corvette-sized vessels, not a scratch was put on the Birok-class battleship which led the fleet. This confirmed the worst worries of the Starfleet admiralty and provoking fierce arguments about reassigning Starfleet resources from exploration and science duties to military patrol. Section 31 wisely took advantage of the stranding of the main Cardassian task in Bajor to complete repairs in 2312.08 to pay off a large number of Orion mercenaries. 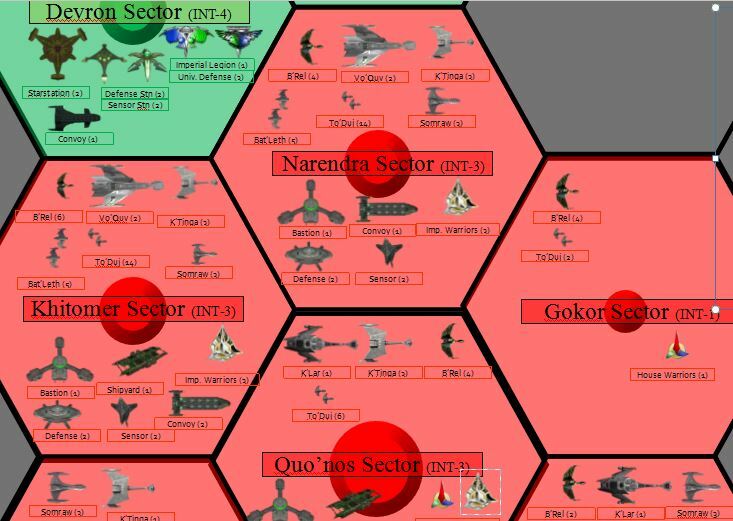 The mercenaries attacked the vulnerable Cardassian convoys massing in the Goralis sector, presumably for an invasion of the Bajoran colony worlds in the Bajor sector. It is the hope of Section 31 and the Federation leadership that between the battle in 2312.07 and the raid in 2312.08, the Cardassian Union has been put back several months on any aggressive plans they have towards the Federation or Bajor. 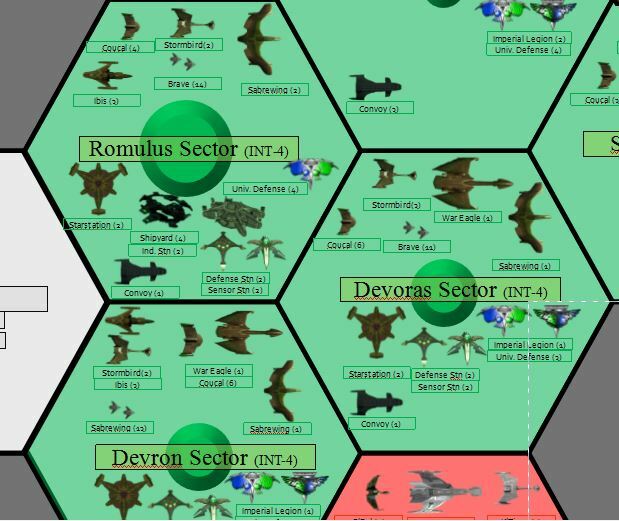 Repeated deep-space scans of the Neutral Zone (in game terms, several espionage: fleet missions) revealed that the Romulans seem to be keeping their promises after the suspicious activity in 2311 and early 2312. Section 31 believes this is due to their encounter with a new power in the Beta Quadrant called the Garidians, who have proven hostile to attempts to integrate them into the Romulan Star Empire. The Klingon Empire has been quiet - though it is possible they are busy with rebuilding efforts from the explosion of Praxis decades ago, the peace of Khitomer is always fragile. 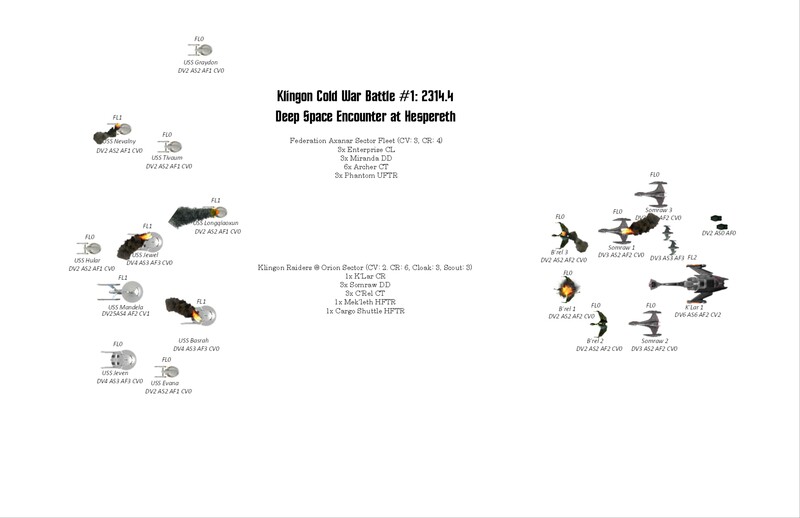 Klingons love nothing more than a good fight, and we do not know how well they have charted the border systems between Axanar and their borders - only that they haven't claimed formal control of those systems. The year ended on a positive note, overall, in terms of peaceful development. Two deep space industrial stations in the Coridan and Sol Sectors will provide additional replicator capacity to member worlds, and a successful terraforming of the planet Regula in the Coridan sector has given settlers new room to take root. Finally, a new step forward in ship design is taking shape - new Warp 8+ engines and hull materials are to be tested on the new Apollo class cruisers, plans for which are now available, though we don't even have one in the drydocks yet. Turn records of 2312 (note: I made, as usual, a couple of minor bookkeeping errors.) 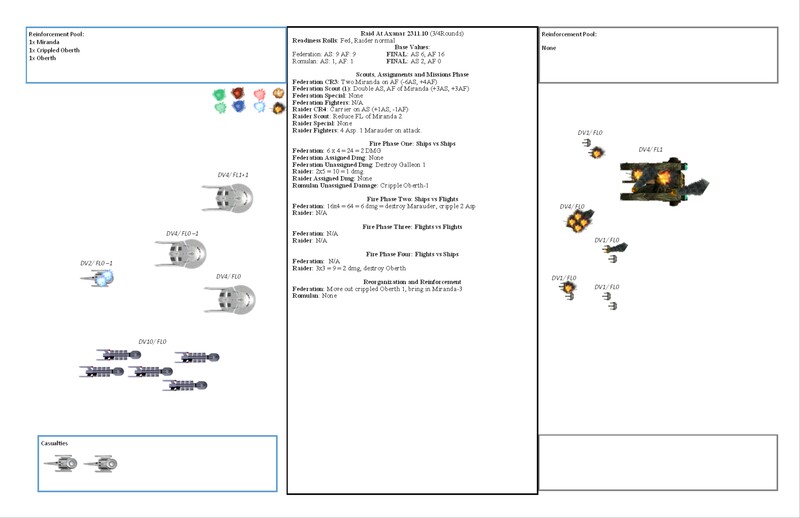 I'll also make a few changes to rule implementation in 2313, like tech costs, supply radius, etc, so next year will go slightly differently. Let me know what I can do to drum up interest here! Change Empires I am playing in the narrative for a while? Give you PDFs instead of IMGs? More character based and less big-picture narrative? I would like to hear from anybody reading! I give the other powers a full update based on their abstracted priorities and economic output once every six months unless I'm in direct conflict with them. If I'm in direct conflict, I'll either run them in full or update them every two months or so. 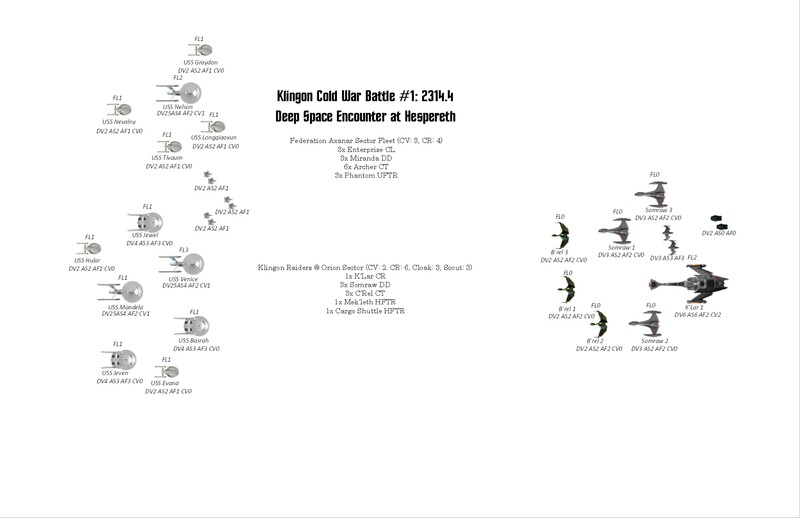 Here's the heavily fortified Klingon-Romulan border...things seem tense. wminsing wrote: This campaign looks amazing. Trying to catch up on all the new playtest material that's been posted lately so I can understand it all! Thanks! It's great to have an audience at all - the forum went through a surge of activity last year that seems, sadly, to have died off a bit. 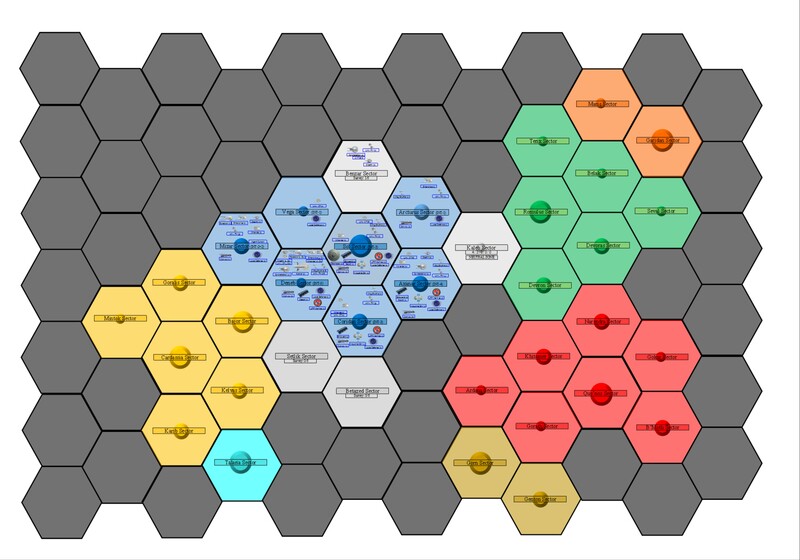 I really like the Galaxies rules, though there are still some rough-around-the-edges areas in them, and am having a lot of fun with this. Let me know what I can do to make the campaign more fun to watch! I've been lurking the boards since I purchased 1E years ago and I appreciate and enjoy the various campaign diaries/journals tremendously. 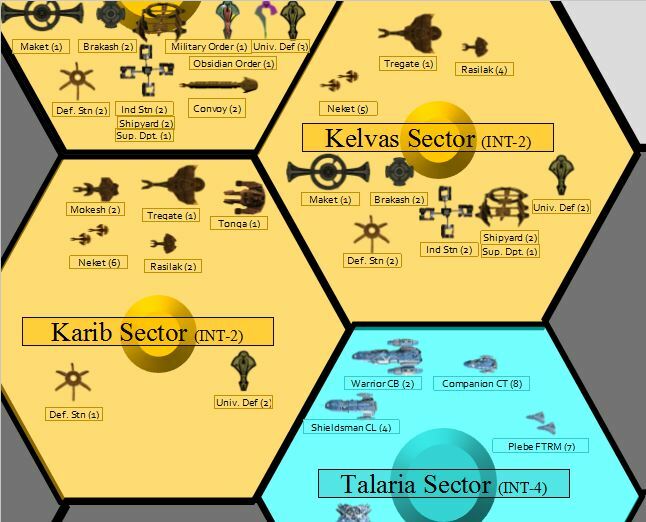 Will the Federation regret the Second Bajor Intervention? Is this kind of risk justified for a non-member of the Federation? Could relations with the Cardassians have gone better? 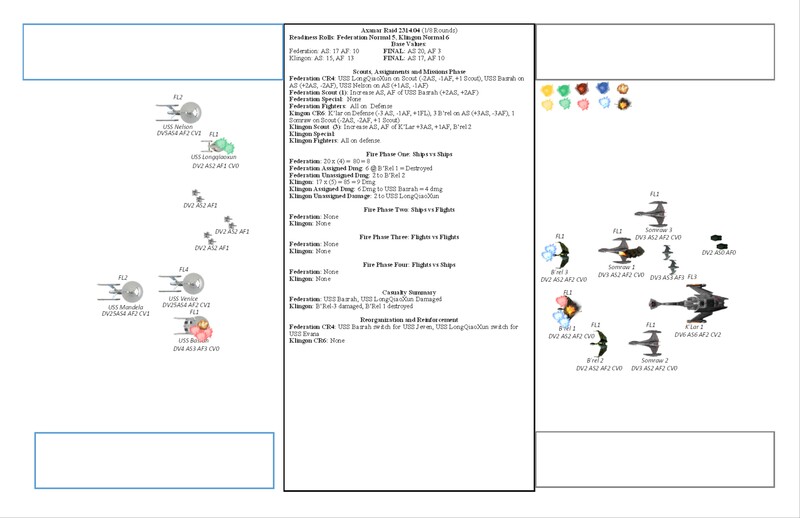 When will Starfleet Command acknowledge that our attack fighter operations are woefully out of date? Last edited by BroAdso on Mon May 29, 2017 4:51 pm, edited 1 time in total. 2313 was a long, difficult year for the Federation and Starfleet, one which created a great deal of resentment between the Federation's civilian leadership and the admiralty of Starfleet. As the year began, a debate was raging about whether and how the Federation should commit resources to defend and aid the neutral colonies in the Bajor sector. On the one hand, the Bajorans had a fanatically religious, caste-based society, and had only low-warp ships - not prime candidates for Federation membership. But they were being probed by small fleets from the larger Cardassian Union - though not officially at war with the UFP, the Cardassian Union was clearly hostile and Starfleet vessels met their ships in limited, but hostile, situations several times in 2311 and 2312. The long term goal of increasing the number of large, capital ships in Starfleet was well under way, with the new Axanar ships nearing completion and the first Apollo class next generation starships, testbed platforms for a whole new generation of technology, under construction. Add to that the increasing pirate threat - a raid by marauders on Axanar, and another on Arcturus in 2310 - there was increasing discomfort among member worlds with committing to a large scale aid and peacekeeping commmitment. 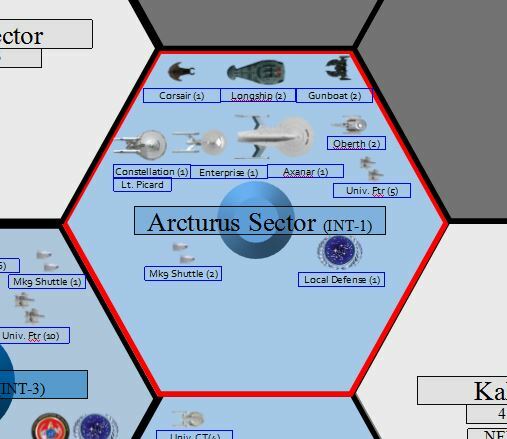 The aid at Arcturus in 2312.06, was quite serious, and actually succeeded at ousting the Federation sector command, led by a fresh young Lieutenant named Picard, for a month. 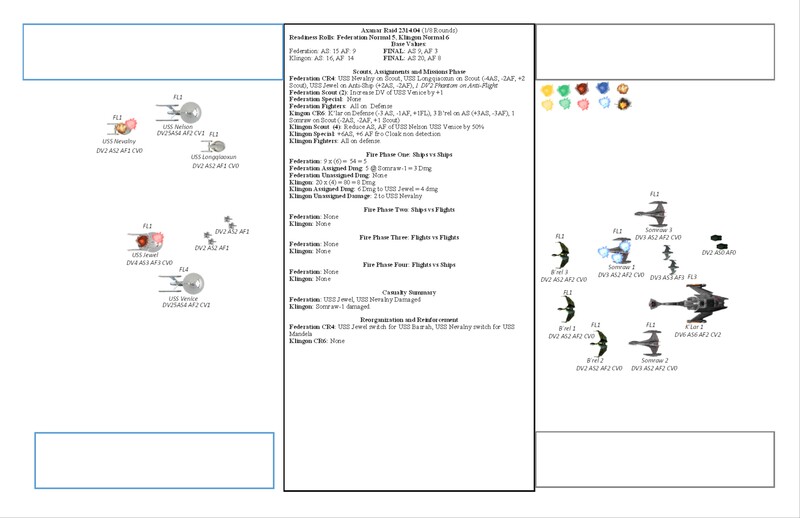 However, the new Axanar class battle carriers did get a chance to show their flexibility as flagships during this second incident, which emboldened the hawks, particularly the Tellaraite delegation, in the Federation Senate. After furious debate in the Senate, during which Admiral Sulu spoke out about the folly of moving too many ships away from Starfleet's core exploration and science functions, the Federation ordered Starfleet to fully commit to Bajor. 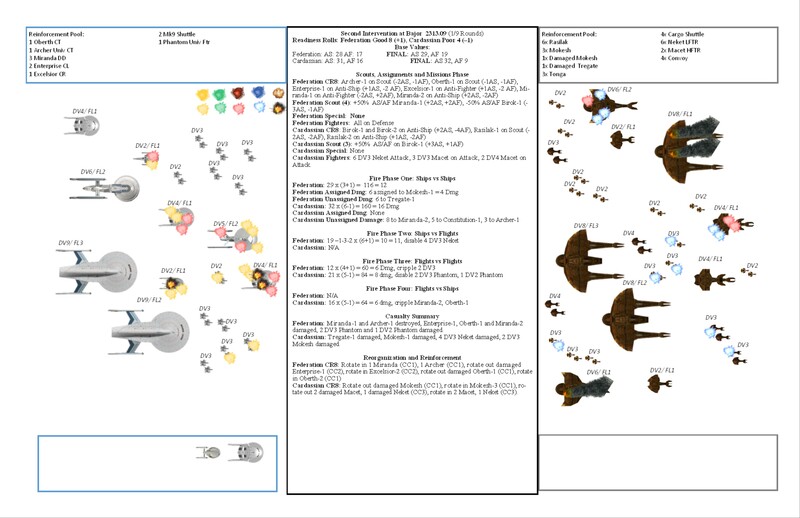 Starfleet had, by 2313.4, two newly constructed Axanar class carriers, and built a fleet around them as the core. After several attempts to discern the Cardassian's fleet strength through long range scans and espionage, Intervention Force One met the Cardassians just before they initiated a ground invasion of Bajor itself. 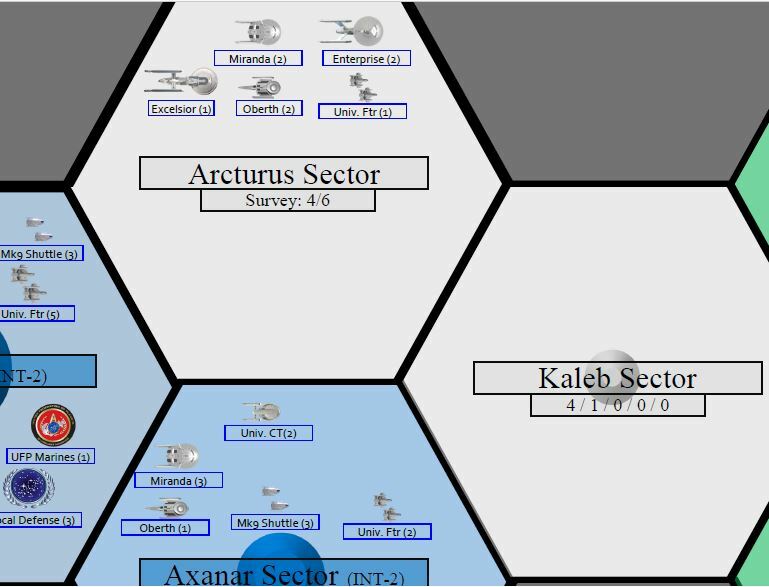 Admiral Revem, the Tellarite in command of the fleet, hoped that the lessons of the brief encounter the Federation had in 2312 in the same Bajor sector would be helpful, and the fleet's strategic and tactical plan was oriented around eliminating the maximum number of enemy scouts and ancillary ships. When the Federation task force retreated after two major encounters roughly a week apart, on the outskirts of the Bajor system, the damage was terrible. 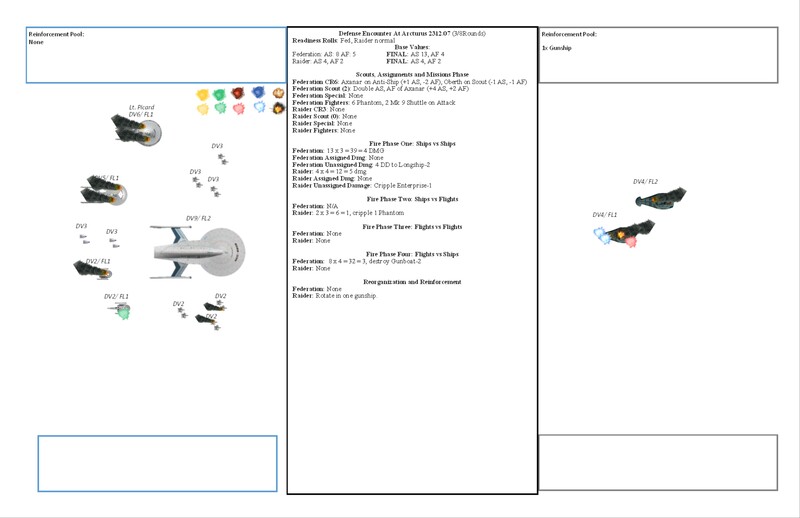 Most importantly, the USS Axanar, first of her class, was cut off from the fleet by three Cardassian corvettes, and destroyed by a several squadrons of Macet-class warp capable fighters, taking Admiral Revem with it and focing the whole fleet to retreat. Without the knowledge of the rest of the Senate, a masterful pair of moves by Section 31 prevented things from going too badly awry: they began supplying Bajoran resistance with advanced weaponry, and bribed Tzenkethi raiders to attack the Cardassian fleet in Bajor in the months after the raid, which prevented the Cardassians from effectively providing assault bombardment to help their ground troops. 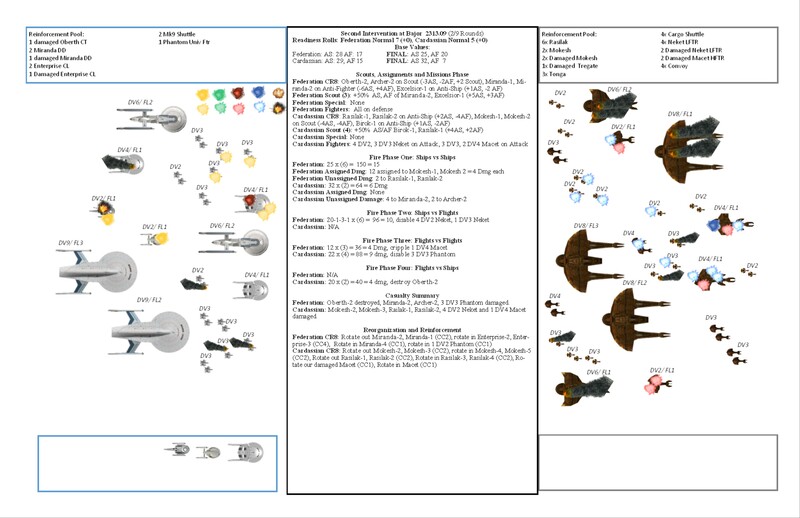 Admiral Revem's replacement, under pressure from the Senate, conceded that with better use of the Federation's superior sensor and electronics aboard new Constellation class cruisers, Bajor could still be saved, and so a second intervention fleet departed Deneb in 2313.12, after it was revealed that the Cardassian ground invasion was stalled. 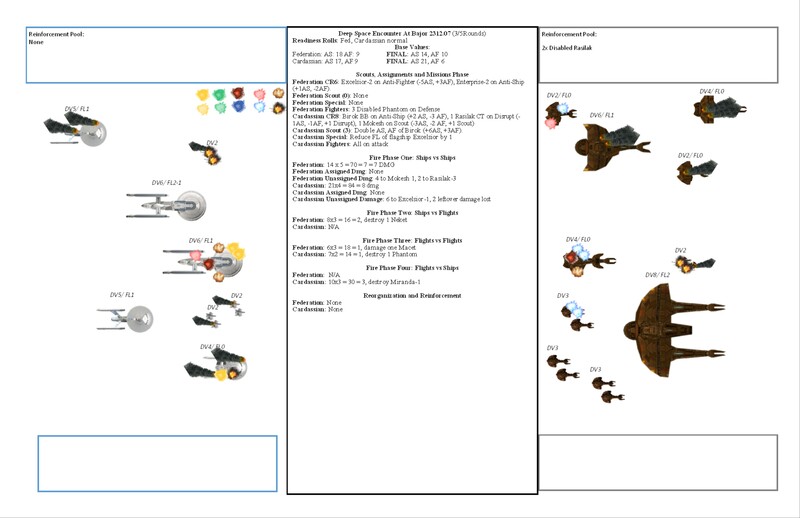 Things did not go much better the second time around, as the fleet, led by the ill-fated USS Axanar's sister ship the USS Tokyo, encountered the main force of the Cardassian invasion force in the outlying sector system of Hespereth - with no real chance to disrupt ground force operations in sight. At the end, the whole force had to retreat to Deneb - and by the end of the month, Starfleet Intelligence (and, more importantly, Section 31) had reported that Bajoran resistance had collapsed. These conflicts were important. But they were secondary, in a way, to the majority of the Senate and the member worlds. 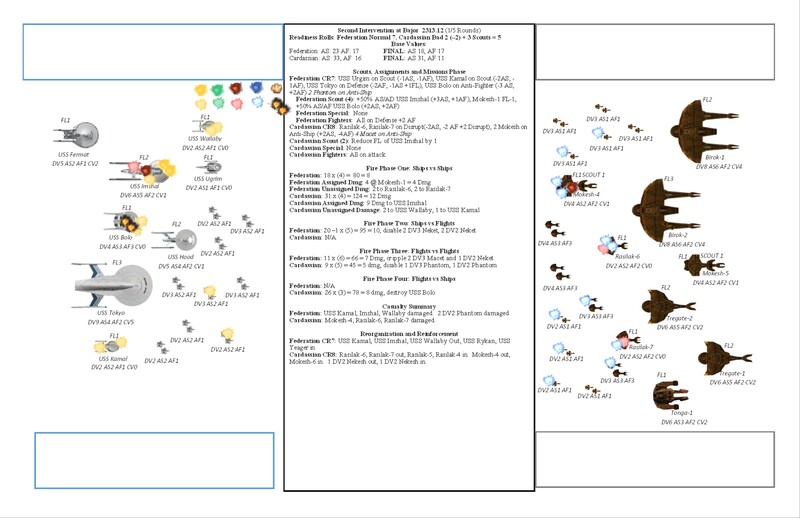 During the whole year, the Federation government was more preoccupied with terraforming land for settlers and expanding the Federation's exploration with several additional Enterprise-class exploratory cruisers - a strategic investment of huge amounts of energy and manpower in game terms, I spent probably 200+ EP on terraforming to achieve the objective I rolled- on turn 1 of 2314 I'll get a beautiful 16VP out of it, though. The ship design division also diverted substantial resources into developing a new subwarp interceptor capable of countering the Cardassian Macet bombers which did so much damage both to the civilian population of Bajor and to the three Federation task forces that could encounter them - these new Coyote type fighters are ready to enter production next year. 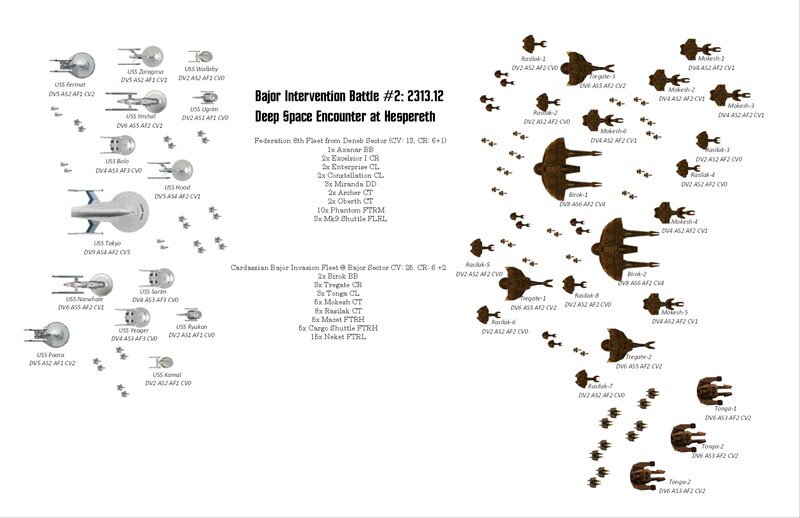 All these civilian and R&D investments meant that when the first intervention went so poorly, the attempt to reinforce the fleet stripped Axanar, Mizar, and other outlying sectors of resources. However, it meant that the year saw a rapid expansion of colonial ventures and colonies, which helped to take the edge off the difficult battles - and more importantly, continued to keep the Senate and member worlds happy. This booming economy may be the Federation's best hope in 2134 to rebuild Starfleet a bit, and explore in the Setlik and Betazed sectors - something that Starfleet's officers are much more eager to do than engage in any more interventions with the Cardassians. 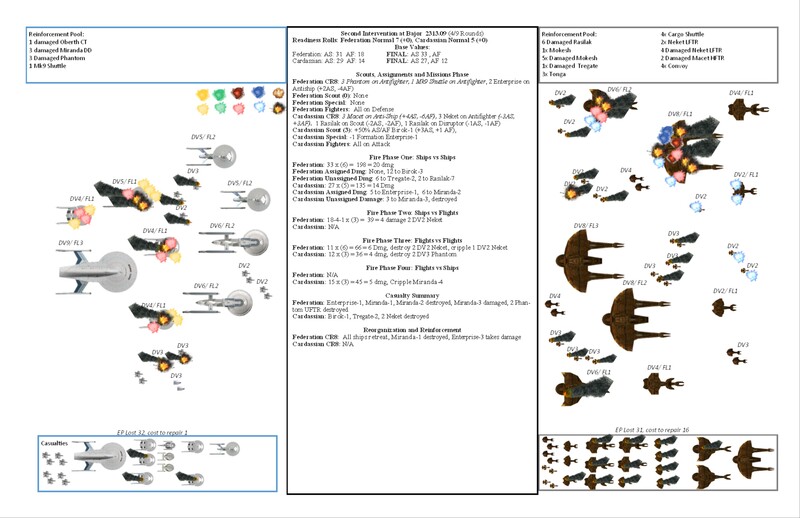 And here's the broader galactic strategic picture from the viewpoint of the Federation. 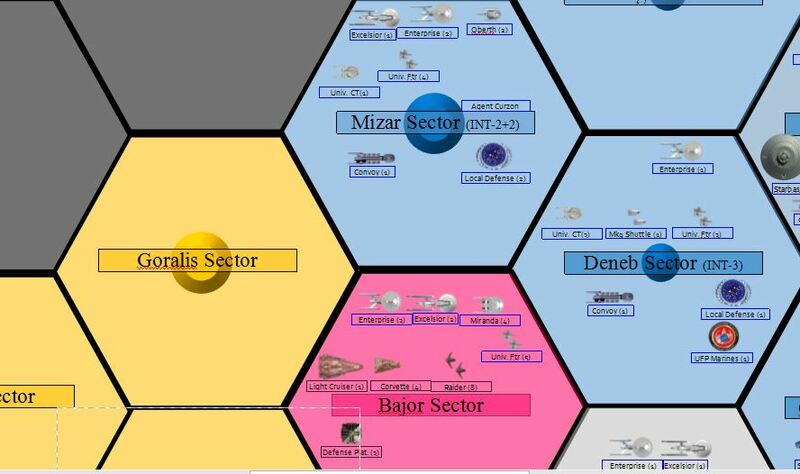 Note the expansion of nonaligned powers, like Bajor was, throughout the map. Whew! Updates from the other power's viewpoints incoming soon. 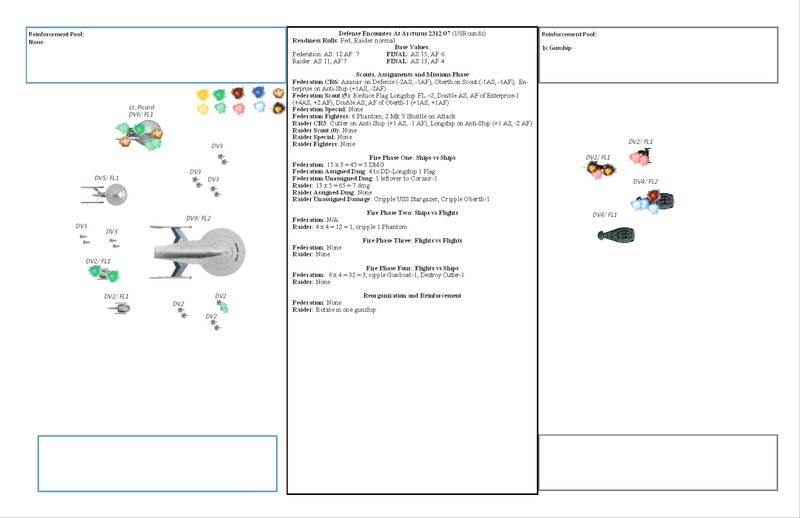 Here are a couple of supporting PDFs. Really great campaign reports, BroAdso! I've been stuck in the dilithium mines in Coridan the last few months, but it's always great to see that the Federation is keeping up the fight in the Bajor sector! Hopefully neither the Romulans nor the Klingons decide to take advantage of this situation, as it looks like the Federation fleet is well and truly committed to the Cardassian border for the foreseeable future. It was too bad to see the Axanar carrier go down like that. 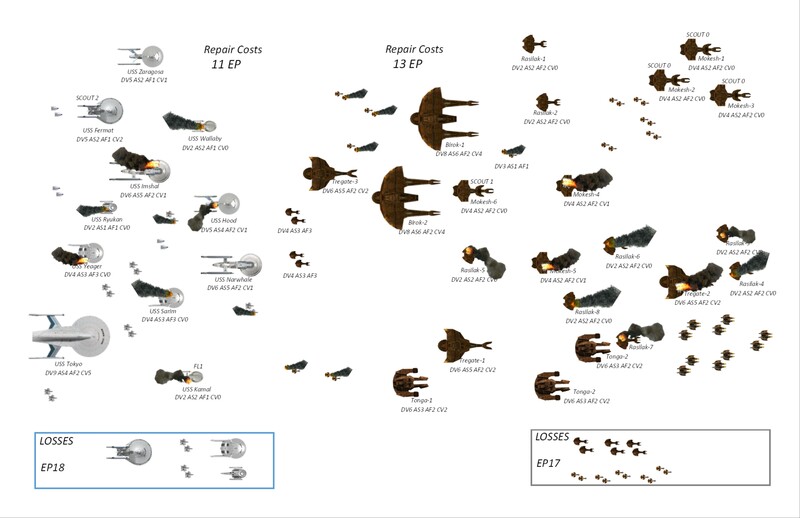 Losing capital ships hurts (a lot! ), and replacing them takes time -- and sometimes attrition piles on a bit too fast. Tyrel Lohr wrote: Really great campaign reports, BroAdso! I've been stuck in the dilithium mines in Coridan the last few months, but it's always great to see that the Federation is keeping up the fight in the Bajor sector! In fact, with those two battlecruisers, the Cardassians should be careful lest the Talarians get adventurous. And speaking of those Klingons - it appears they've done a better job mapping their border with the Federation than the Feds have, since a Klingon raiding force slipped through the unexplored (by the Federation) space south of Axanar to test our defenses. The battle was inconclusive and the Klingon government denied it constituted a treaty violation, since it was House, not Imperial, soldiers, but it did show how vulnerable to Romulan-Klingon border area is to the alpha strike that cloaked ships provide. 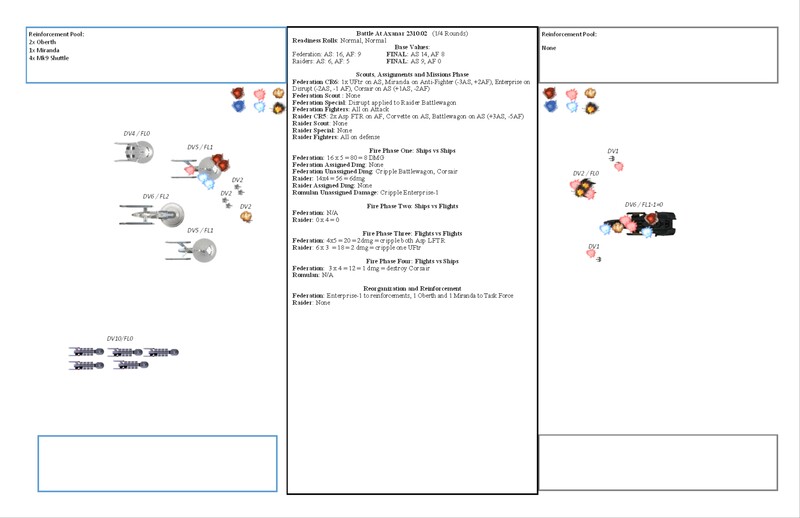 The Klingons withdrew all their ships after the loss of one B'Rel, but now we have to devote EP and capacity to repairing the two Mirandas and two Archers damaged in the raid. 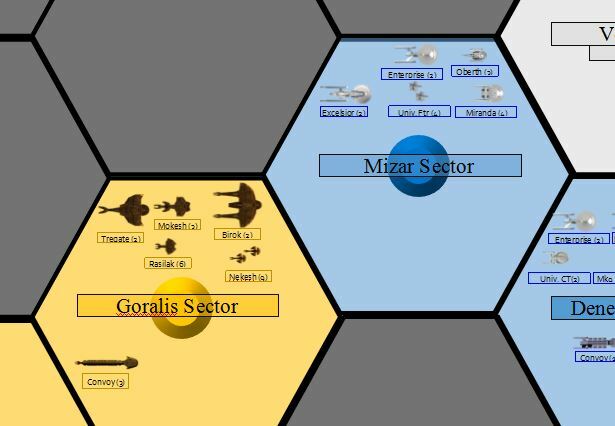 So far, for the Federation, the year seems devoted to building up orbital defenses in case the Cardassian cold war escalates into outright invasions of planets. 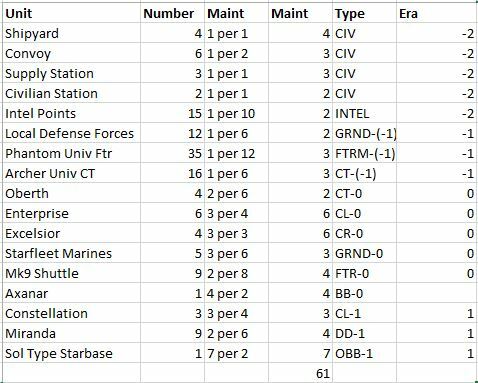 Most importantly, they had a glaring hole in our upkeep, with only one of two allowable expensive Sol type bases for the same upkeep cost, and they're rectifying that. Hopefully the huge amount of money sunk into terraforming and productivity will pay off this year and next and let us gain an edge over the other factions. The Federation are also having a hard time deciding what tech advance to shoot for when their investment comes to fruition at the end of the year (assuming they keep investing quickly). 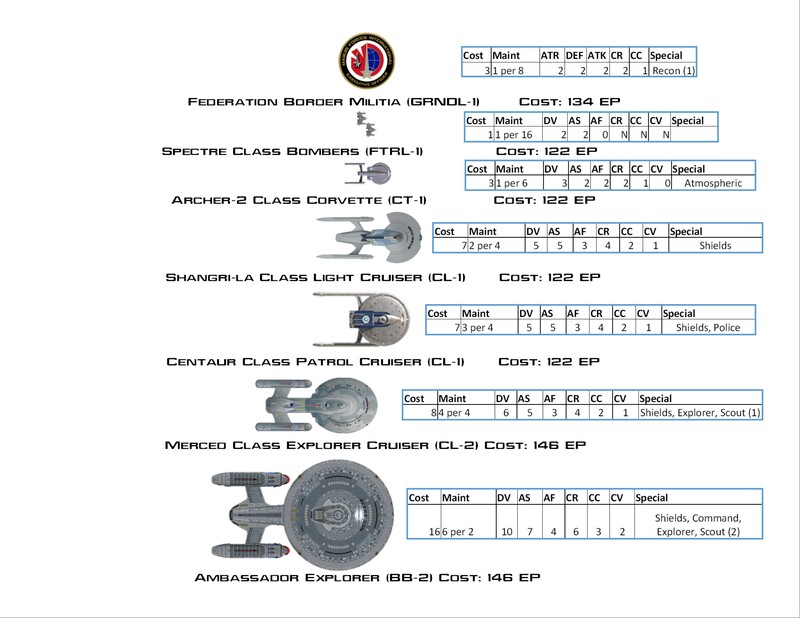 Should it be an upgrade to the ubiquitous Archer Corvette, the Archer-II (research CT-1), which brings it up to date with Excelsior, Enterprise, and Constellation technologies? Or maybe a bomber to complement the recently perfected Coyote class interceptors in the hangars of our Axanar class carrier (another FTRL-1, so cheaper at 122 EP)? 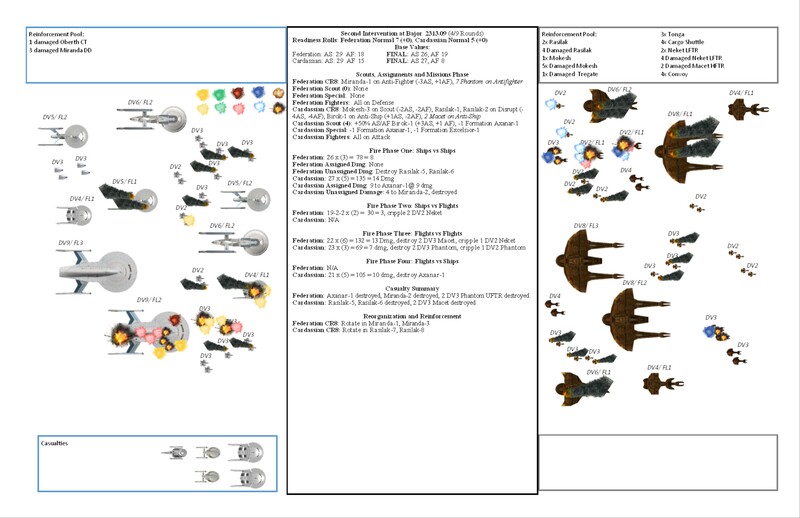 An upgraded standard light cruiser (CL-2) to supplement the Constellation (CL-1) and replace the old Enterprise class (CL-0) in exploration? 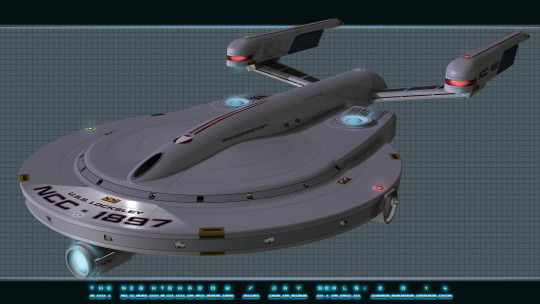 Or maybe some radical leap forward in technology, like the proposed Ambassador- class heavy battleship and explorer? The year moves slowly forward for the Federation, which looks on anxiously as the Cardassians pacify their new conquest in Bajor and rebuild their fleet, and new insecurity threatens from the Romulan and Klingon borders.